Our front garden has been a sorely neglected part of our house, since moving in nearly a year ago. Throughout our house renovation, the front garden had been used as a dumping ground. 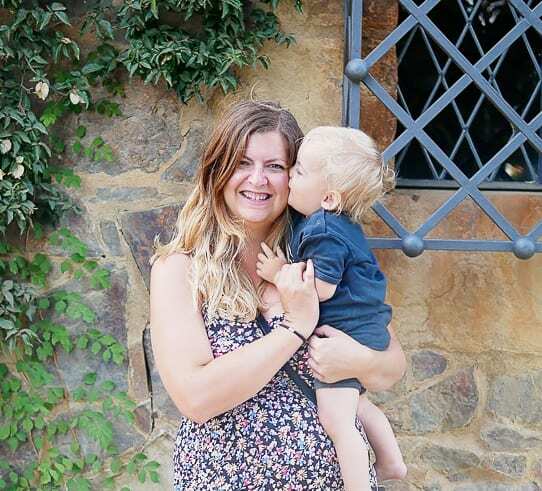 We were so proud and eager to show off what we’d achieved with our home inside, but the outside, the first thing that everyone sees when they arrive at our house, looked more like a building site. It wasn’t a great first impression. The existing gravel was OK, and could no doubt have been made to look presentable. But we wanted a more modern look for our front garden, as well as a mix of textures and surfaces, rather than the purely ‘hard’ look of paving stones and gravel. 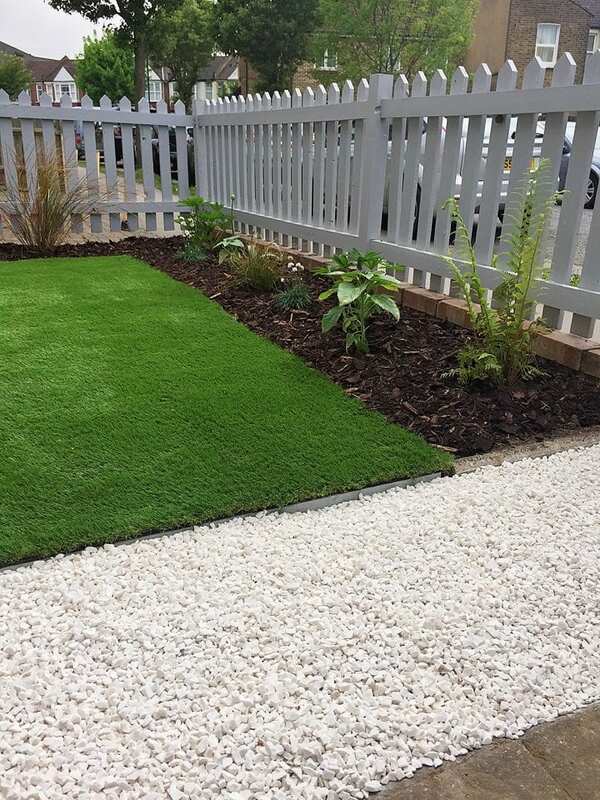 When Carpetright got in touch to ask whether we had a garden project that could use a ‘fakeover’ with artificial grass, we immediately thought of our front garden and how the addition of artificial grass could give us that ideal modern texture we’d been searching for. I made a Pinterest board for our front garden redesign, and also knocked together a moodboard so that we could more easily visualise the colours and textures we wanted to incorporate. When we started, I had quite a few ideas and wasn’t entirely sure how to start. Neither Sam or I had ever designed any element of a garden before. But by looking at our ideas as a whole, it was clear that we wanted to focus on greys, whites, greens, and modern, clean lines. Sticking with these elements, we were confident that it would all pull together into a cohesive design. Sam had no experience with artificial grass before, but found the installation process very simple. The most important part is making sure your base is as compact and flat as possible, to ensure a smooth surface for your grass. This stage was the part that took the longest, actually installing the grass took no time at all. Sam worked on our front garden makeover in stages whenever he had a bit of free time, but all in all, preparing the base and installing the artificial grass took about half a day, with another half a day for the flower beds, potting plants, gravel, etc. We are so happy with the finished results! To prepare the base for the artificial grass, Sam actually kept all the gravel that was there already, adding sand to create a smooth, compact base. He built a timber frame around the edges of the base, so that the grass could be tacked in place. Artificial grass is extremely low maintenance. We aren’t going to get weeds growing through, like we might with gravel or paving. And it never needs cutting. We can even hoover it with our cordless vacuum when it needs a bit of a tidy! The fence got a new lick of paint using Cuprinol’s Garden shades in Cool Marble – a light grey shade that we love. I love a geometric pot, and these black square ones were exactly the sort of thing I had imagined. Sam is very keen on creating as bee-friendly a space as possible, so we chose lavender for our potted plants. Sticking to purple, white, and green shades for our plants and grass helps to keep our modern front garden looking neat and cohesive. We wanted a mix of material to add texture and interest. We’ve got gravel, bark, greenery, plus the more industrial tones of the grey painted wood and plant pots. I thought I’d show you a picture of the more ‘practical’ side of our front garden, too. I think eventually we will build in wooden storage so the unsightly recycling bins, etc, are not always out on show. There are certain ‘milestone’ photos that I always want to take outside the front of our house. Bringing our babies home for the first time, and the classic ‘start of the school year’ photo with my children in their fresh new uniform, ready for the year ahead. The outside of our house has always been such an eyesore, that I have been taking these photos inside against a plain white wall, instead. Now that our front garden has had it’s smart modern makeover, I know exactly where I’m going to be taking Rory’s ‘First Day at School’ photos when he starts reception in September. As soon as the grass was ready, the children wasted no time in testing it out. it actually works very well as a little play space for them – much more versatile than the gravel we had there beforehand. I’m not sure words can describe how much I love our new front garden. It’s partly because of the simple fact that it looks so much better than it did before – it’s like looking at a completely different space. But it’s mostly because I’m proud of Sam’s hard work with the DIY, and successfully being able to take an idea from paper to reality, when we are complete gardening novices. This is the first garden project we’ve embarked on, and I’m so proud that the results are even better than we first envisioned. Thank you to Carpetright for providing our artificial grass for the purpose of this feature on our front garden makeover. You can click here to find Carpetright’s full selection of artificial grass from £9.99. Wow – what a massive difference! The front seems so much brighter now – it looks brilliant! This looks ace! Artificial grass is becoming a real thing isn’t it? I’ve noticed it around much more and I can see the benefits although I do think I would miss the smell of freshly cut grass!